It rained today, it rained yesterday, it rained Monday, and there is rain in the forecast for Thursday and Friday as well. I suppose I should be thankful that it is at least staying warm enough that it is raining and not snowing, but that is little consolation in a week that is as dark, dreary, and damp as this. Really, when conditions are this miserable, there is only one thing to do, and that is to hole up at home and make soup... again. Even though we had soup yesterday, there was only one thing that sounded good for dinner tonight and it was another piping hot bowl of comforting, delicious soup. This time, I turned to another old, beloved recipe which I almost always have all the ingredients for in my house at any given time. That is not to say that it has common ingredients, but rather, that I am the kind of person that considers Parmesan cheese rinds and cannellini beans to be pantry essentials. Actually, I largely consider them to be must-haves in my kitchen because I love this soup recipe so much that I need to be able to make it on the fly. The only reason that I haven't seen fit to blog about it in the past four years is that it is a polarizing recipe; whereas I love it, and Justin enjoys it, both of my parents dislike it because it is pureed, and they prefer their food to have texture. I find it so savory and flavorful that I don't miss having to chew, plus, I don't really enjoy the texture of beans or their skins -- a problem that is solved by pureeing. 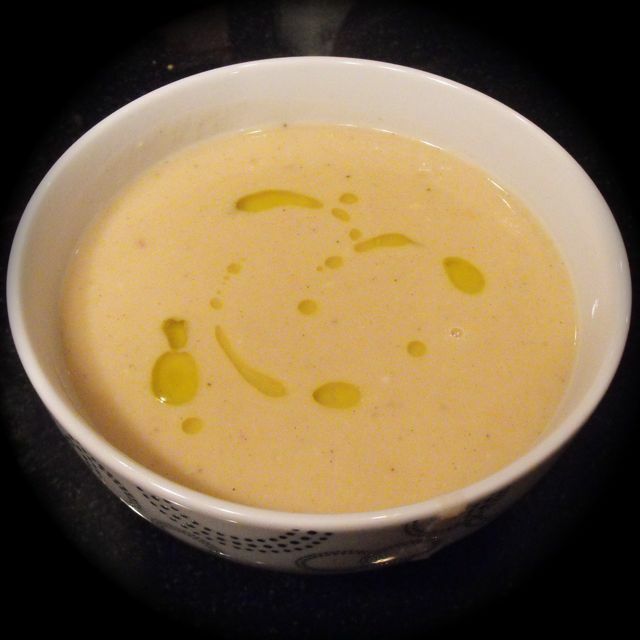 I wasn't sure how other people would feel about eating a virtually liquid soup, and the bowl of texturally homogenous beige liquid doesn't exactly photograph in a way that sells its enticing qualities, so I kept this recipe to myself for years. However, now that I needed to try to get a decent picture of it for my new recipe book, I figured it was time to go public with this recipe and let you make your own decision about whether pureed food is right for you. It really is one of my favorite soups in my repertoire, not only because it involves minimal chopping and prep-work, but because all that Parmesan cheese basically turns it into a big bowl of umami, that elusive but highly satisfying fifth taste. If you leave out the heavy cream, as I sometimes do when I want to freeze the leftovers or I just don't happen to have any, you have an almost healthy dish on your hands. Plus, if you prepare it with vegetable broth, it's a lovely vegetarian meal, if you're entertaining guests who don't eat meat. If you don't mind the lack of texture or toothsomeness, please, I implore you to give this soup a try. Your palate will thank you. 1. Melt the butter with the olive oil over medium high heat in a large pot. 2. Add shallots and a bit of salt and cook until softened, about 3-5 minutes. 3. Add the beans, sage, chicken stock, garlic, and cheese rinds. Bring to a boil. 4. Reduce heat to low and simmer for 25-30 minutes. 5. Turn off heat, remove cheese rinds and puree soup using an immersion blender. 6. Stir in the grated cheese and heavy cream (if using) and warm through over low heat. Serve with fresh artisan bread.